I've been comming to Beckys Drive-IN for so many years now. My kids love the play ground n food! It's nice n clean too! Best place round, KEEP UP THE GREAT WORK GUYS!!! We love coming to Becky's every year. I love your drive-in. You have a good variety of movies, great food, cool souvenirs and your property is well kept with super clean rest rooms. It's always an adventure to see a movie there. Thank you for making it such a pleasurable place. I have been bringing my kids to Becky's since they were babies and now they are bringing all of their friends. We just love this place! It's a perfect weekend adventure. Saturday night I get to watch a couple movies and my husband gets to sleep. This year I hope to be on time for trunk or treat! We love coming to Becky's and bring our well-behaved dog with us. We come because you are pet friendly and thank you for it. We love the adult dramas so that adults without human kids can have fun, too. See you soon under the stars. I love you guys. My family goes almost every weekend when we are free. I've been bringing my sons since they were toddlers. We are loyal funnel cake fanatics, and proud to wear our pjs. Becky's is part of our family's summer ritual, no matter what's playing, we love the place. Love your new website! Makes it fun to visit now! But really love you folks. You have re-introduced the drive-in to a whole new generation. Keep up the good work! never been to a drive-in but i know its a perfect date night. really excited to go! Sitting under the stars, with family and friends, watching 2 movies! Brought my lab last summer for his bucket list. Thank you for helping me create a great memory. 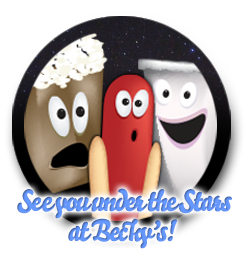 Love going to Beckys and relaxing under the stars with a good movie and snacks. Love going to Beckys and meeting up with friends for a good movie! The kids love it too! Haven't been to Becky's yet but my grandkids just moved up from North Carolina and I can't wait to take them. Love the new easier to navigate website.